The following are detailed overviews of sites where you can play backgammon online, against live players from around the world, and win cash based on your skill. GammonEmpire is a new state-of-the-art Backgammon site, featuring a stunning 3D graphics engine. Play for free or for real money with people from all over the world. Join hourly, daily, and weekly Sit & GO and Event Tournaments and win cash prizes. Improve your ranking among other players, accumulate starts and redeem them for bonuses. 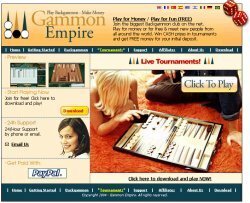 GammonEmpire is all about bringing the Backgammon enthusiasm and excitement to people worldwide, enabling professional and amateur players to play against each other in a geographically boundless environment. Our passion for the game is reflected in the software, game-play and customer care: we try to make them as realistic as possible to maximize the gaming experience – In other words, make it more FUN. Through GammonEmpire, you can learn more about the game, improve your backgammon skills, meet new people and last but not least: Make a lot of money by beating other people in your favorite game! Play Backgammon at Gammon Empire! Playing Backgammon on Play65 is exactly the same as in real life, only you get to meet exciting people from all over the world and play against them for either Fun Money or Real Money. Fun Money games allow you to play and practice Backgammon for fun and enhance your skill at the game. Once you've mastered the basics of the game you can move up and play to win real money. In addition to the one-on-one games, Play65 also offers Sit & Go Tournaments and Event Tournaments, where you can test your skills and see if you can come out on top. Play65 gives you $10 in free fun money to get you started. WorldWinner is where the world competes to win cash and prizes at games of skill. It is one of the oldest and largest cash game sites, and was founded with a commitment to becoming the premiere destination for skill-based tournaments. Today, the company is a recognized leader and the pioneer in skill-based gaming as it continues to define industry standards and deliver an experience that is the fairest, fastest, and most fun around. 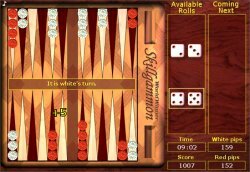 WorldWinner's Skillgammon is a more strategic, skill-oriented version of backgammon. You will be playing red, and a computer-controlled opponent will be playing white. Instead of rolling dice, you will be selecting from up to five different possible dice rolls. Once you've used up all 5 rolls, you'll be given another five. Other than the dice-rolling changes, the game is otherwise the same as regular backgammon. Skillgammon is an interesting variation on the classic game, offering new strategy possibilities, and greater opportunity for skillful play. It's worth checking out. tournaments for members who thrive on competitive play. Enjoy the thrill of competition in one of their daily cash tournaments. 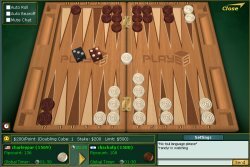 GameColony's backgammon game features true peer-to-peer and tournament play for fun or for cash with no downloads, full chat and instant message functionality, and no aggravating ads or anything else that gets in the way of what you want to do – play games! GameColony utilizes the Internet's global reach to bring players together from all over the world and create competitive online events that are universally popular, rewarding and secure. With no lengthy downloads, no subscriber fees and the allure of instant cash prizes, GameColony has created an enthusiastic online community, filled with healthy competitive rivalry, passion and fun. The site hosts thousands of games daily. 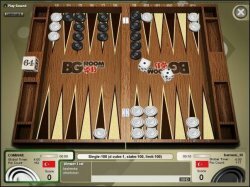 Enjoy free and real-money backgammon games 24 hours a day, seven days a week at BGRoom. Their stable, superior software makes the whole experience of playing backgammon online a real pleasure, with realistic graphics and sound that makes you feel as if you were playing live. With over 500, 000 players online and sit & go tournaments running all day and night, there is always a seat available for you. The BGRoom customer support team is friendly, quick to respond, and available 24/7 via live chat, telephone or email. BGRoom is committed to running games that set the highest standard for fairness, security, and privacy. Register at BGRoom to receive a $5 Free Welcome Bonus to play for real money - no deposit required! In addition, your first deposit (minimum $20, maximum $100) earns you a First Time Deposit Bonus of 30%, Also, for every friend you refer to BGRoom, you'll receive $50 in bonus cash when they make their first deposit.